Do you have a black bear I can borrow? I'm serious. I really do need a black bear (not a live one but one to display in an exhibit). In 1912, as part of the development of Henderson Park, a zoo was built here in Lethbridge. It was HUGE -- two black bears and one eagle. The zoo only ran for a few years and was closed due to money problems. The picture here (Galt Archives 19760219024) shows one of the bears in its enclosure. 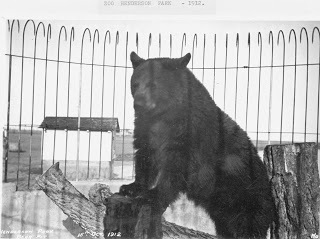 For the exhibit I'm curating on Lethbridge 1906-1913, we think we'll recreate part of the zoo and would like to have a black bear to go with it. We actually have a few leads on where to borrow one but if you have ideas, let us know. The zoo really gives a sense of how people of that time thought and gives an idea of how they saw Henderson Park. We also want to have a really immersive part of the exhibit so are creating what we are calling an Interactive Parlour. We're working with the Lethbridge Community Band to find and get music from the time period. We have books (textbooks and others) from the time period that people can look through. We have Christmas cards from the time period. But we're still looking for more items. If you were to walk into an area on an exhibit 1906-1913 called an Interactive Parlour, what would you expect and want to find there? We're also hoping to create an area in the exhibit on historic buildings with information on those still remaining and an area of ruins of buildings we've lost. Think of ruins from Greece and Italy -- but how to recreate that in a small space and with our lost buildings? So many ideas. So few months to create it all. So back to work I go.